In the 1840's when John Montagu took over as the Colonial secretary of the Cape there was an urgent need to improve communications with the interior of the country. There were a number of passes through the mountains but they all took round about routes to get to the interior. 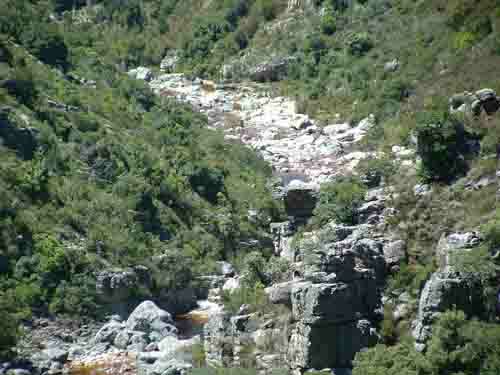 Montagu wanted a direct route through the mountains. One day when riding on the newly completed Mostert's Hoek pass ( now Mitchells Pass) near Ceres with Andrew Geddes Bain, Montagu pointed out a valley running off to the south from the pass. He wanted to know whether this valley perhaps opened up a more direct route to the interior. A few days later Bain and four farmers from the Wagenmakers Vallei or Wellington as it is known today set out to explore the valley from the south side. They left Wellington at 4.00 am in the morning on horseback and rode up to the neck of the mountain where they discarded their horses and set out on foot to explore the valley. The mountain slopes above the Witte river valley are extremely rocky and steep and it took Bain and his party the whole day to walk it. Along the way Bain made sketches of the valley and the mountainside and worked out a path along which the road could be built. After showing his sketches and subsequent plan to Montagu and having them checked by a civil engineer by the name of Charles Davidson Bell his plan was approved and he was instructed to build the road. During the building of the Mostert's Hoek pass prison labour had been used with great success and so Bain was ordered to use this labour again while building the Bains Kloof Pass. Many of these prisoners had special skills which were used by Bain during the construction. What is interesting is that although the labourers were prisoners they were paid for their labour and were given their money when they were released from prison. As it was a priority to complete the roadway the prisoners were given as much assistance as possible by the authorities and were treated humanely while working as labourers. A system of reward and punishment was established which was used to control the prisoners while they worked. Construction began in February 1849. Bain had many problems to solve as many of the slopes were very steep and needed to be strengthened. To do this he used a backfill method which meant that a rock wall had to be built on the outside of the slope and then filled in with sand to form the foundation of the road. These rock walls with the well dressed rocks are still holding the road up today. Once they reached the neck of the valley the real hard work of construction began. Boulders had to be blasted out of the way and rocks split and dressed and packed in such a way to keep the roadway from sliding down the slopes of the mountain. Concrete was unknown so ingenious methods had to be used in the construction. As there was no modern transport facilities in those days it was necessary to keep the labour force close to the construction site. A temporary barracks was built at Eerste Tol on the neck where they were housed while construction continued in the vicinity. As construction moved along the valley so did the prisoners barracks to keep them close to the construction point. Today some of the old buildings that were constructed at the time are still to be found at Eerste Tol. 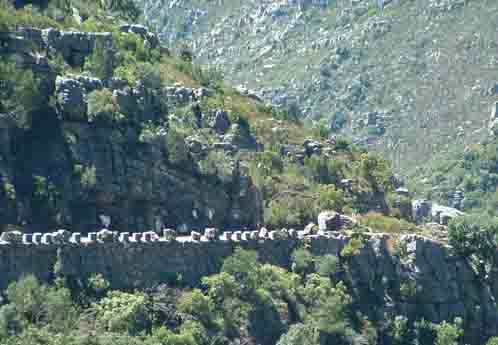 Construction of the pass was finally completed in 1853 when it met up with the road from Mosterts Hoek. 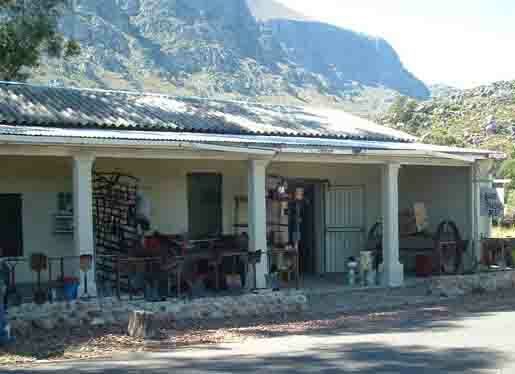 Bains Kloof pass since its completion in 1853 has undergone a few changes over the years. The road surface has been tarred to allow modern vehicles to drive along it and here and there bridges over rivers have been strengthened where they were undermined by the rivers. The buildings at Eerste Tol are still there and the village now has a number of residents, a shop, a lodge with a restaurant and a large building which is used by church groups and schools for camps in the wilds. In between the buildings are a number of graves where convicts who died while working on the pass are buried. 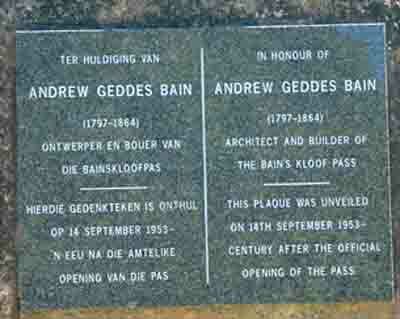 Plaques honouring Bain for his work on the pass are displayed on granite rocks positioned near to the roadway in the village. Bains Kloof Pass is well worth a visit so next time you drive through it stop at Eerste Tol and some of the stopping points along the way. You will marvel at the skill and the workmanship of the people who built this scenic drive along an impossible route with tools we these days could not even use in our gardens.